After a slow start to 2017, the Asian Art market is finally waking up from its brief winter slumber. March is always one of the busiest months for Asian Art in North America - with over twenty-five auctions occurring during Asia Week, New York from the 9th to 18th. As always, sale results will be a strong indicator for the market’s direction in the coming months. To coincide with Asia Week, Bidsquare will be featuring Asian Art sales from two of the larger American regional auction houses. On March 18th, Skinner’s in Boston, MA will be holding their Spring Asian Works of Art auction. Even though Chinese art is still highly represented, the 550 lots also covers items from the Japanese, Indian and Himalayan regions. 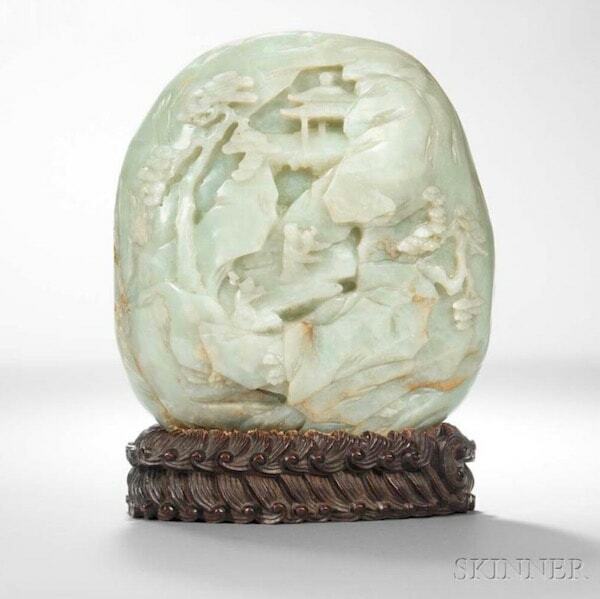 Their highest estimated item is lot 202, Chinese Jade Boulder, China, 18th Century. This large piece of precious stone features detailed carvings of a scholar and attendant walking through a rocky path, with canopies of pine and a small hut in the distance. Jade is still one of the most precious materials in Chinese art. In addition to the popular subject matter, the boulder is carved from a sizeable pale celadon stone, one of the most attractive colors of jade, and one that is highly sought after by collectors of this category. 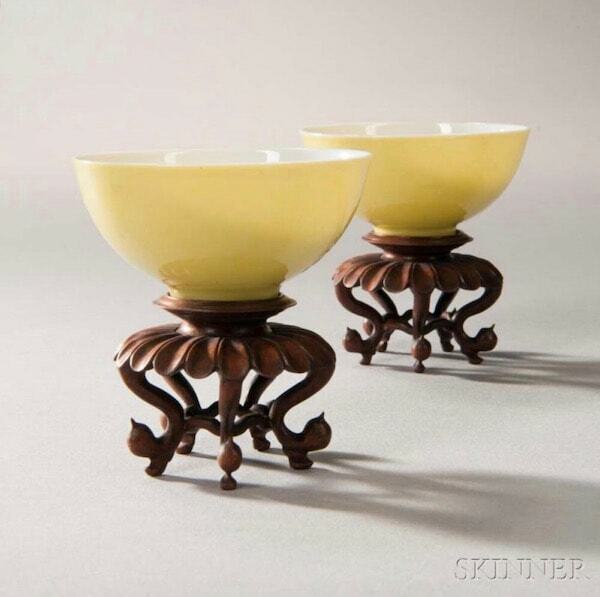 For Chinese porcelain, Skinner features lot 281, Rare Pair of Lemon Yellow-glazed Wine Cups from the Estate of Walker F. Goodman. Their specialist has dated these attractive cups to the Yongzheng Period (1723-1735), one of the most desirable Chinese Imperial reigns for porcelain connoisseurs, collectors and academics. Despite serving as the Chinese emperor for only 13 years, Yongzheng was able to produce some of the finest porcelain wares throughout China’s history. These include blue and white, famille rose and monochrome pieces. The yellow-glazed wine cups showcases his high standards in porcelain production, with its delicate potting and bright, but even colors. The base features a rare four-character Yongzheng reign mark within a double square, suggesting this piece comes early on in the period. 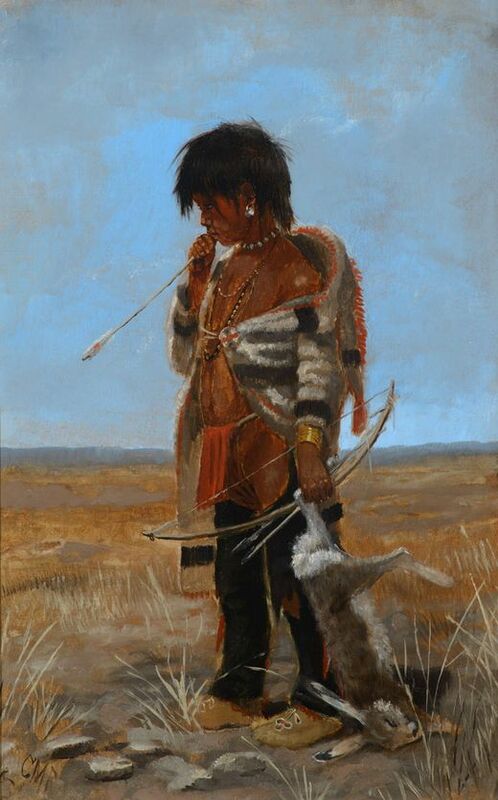 On March 20, Leslie Hindman Auctioneers in Chicago IL will have their sale of Asian Works of Art. With over 650 lots, all of the key Asian regions are represented. 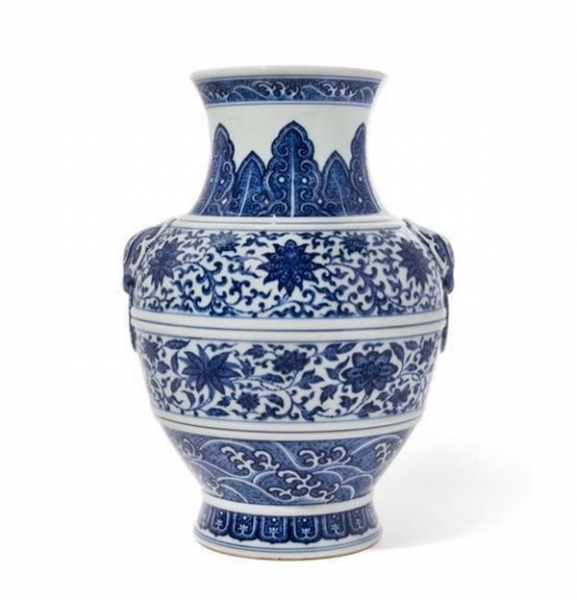 It features exquisite ‘Ming-Style’ design of scrolling vines and lotus blooms, and along with its simulated ‘heaping-and-piling’ effects of the cobalt blue, the vase pays homage to earlier dynasties. This rare vase formerly came from prestigious collections in Canada and Taiwan before making its way to a prominent Chicago collector. The estimate of 80,000-120,000 USD seems reasonable for a vase of this high quality. 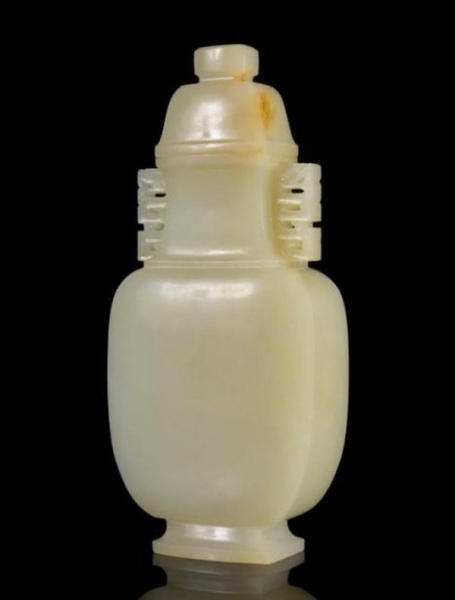 Another highlight at Leslie Hindman Actuioneers is lot 289, A White Jade Covered Vase dated to the Qing Dynasty. This vase is of a good size and with a desirable even, white tone. The archaistic handles are unusual and are typical for late 17th and 18th Century examples. The cover also features a delicate russet inclusion, a feature that many collectors are looking for when they are purchasing jade carvings. Vist us On the Square throughout the month (especially during Asia Week, March 9th - 18th!) to read more about upcoming Asian Art auctions featured in our much anticipated auction catalogs.